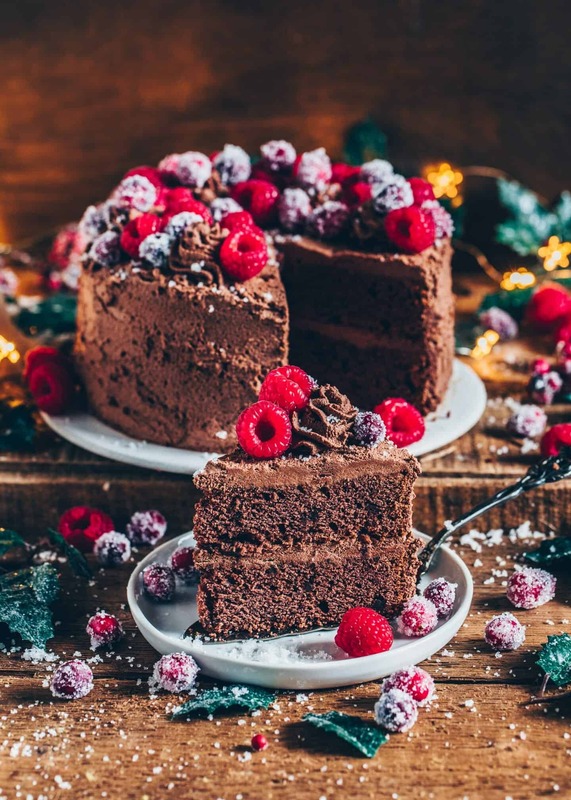 The Best Vegan Chocolate Cake made with simple ingredients in one bowl. It’s incredibly delicious, rich with chocolate flavor, and can be made gluten-free. The perfect dessert for any occasion! For some reason, I could never imagine a world without chocolate! To me, personally, it’s always perfect – no matter which time of the day. You can have it for dessert, or just as a snack, or even for breakfast. For me, chocolate will always be something that lifts my spirits! Do you feel the same? 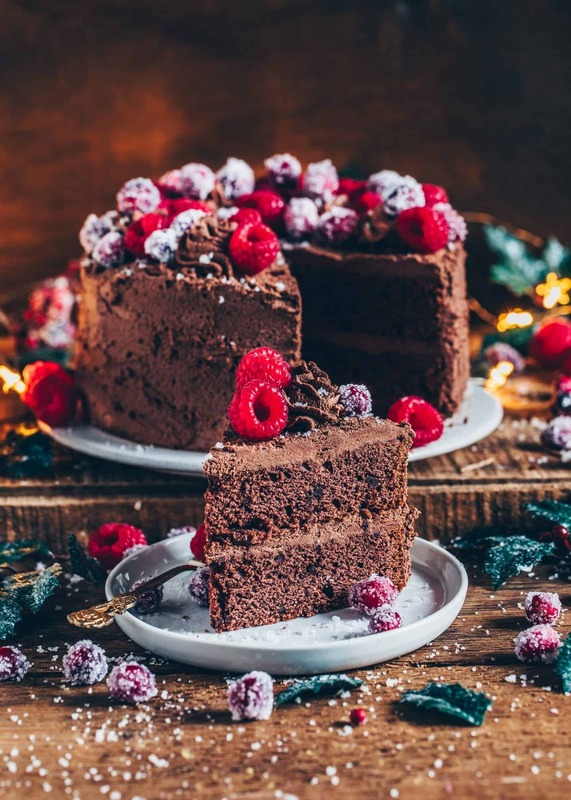 If so, this Best Vegan Chocolate Cake is perfect for you, because is so chocolatey that it’ll definitely satisfy any chocolate cravings! Actually, I’ve been making this recipe for years, but for some reason, I’ve never shared it on my blog. Anyways, to me, it’s just the Best Vegan Chocolate Cake Recipe ever, and I’m also convinced it is definitely fail proof, so it will never let you down. 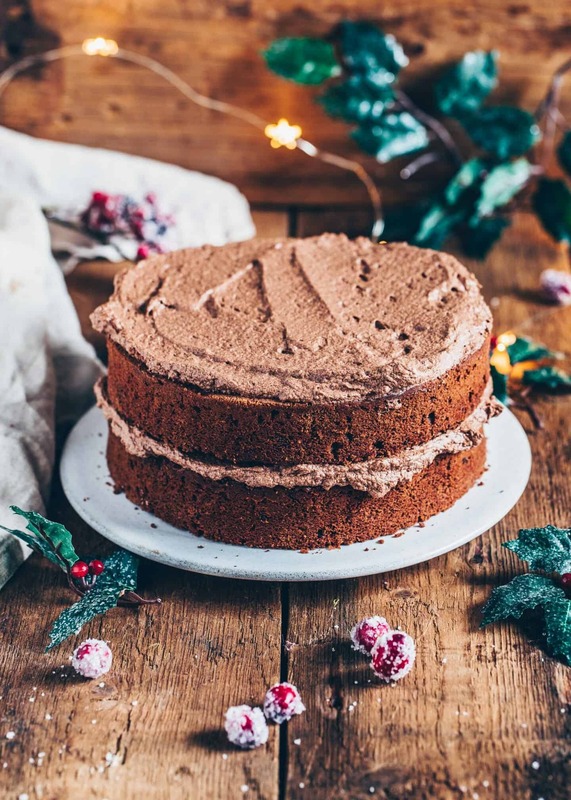 It is intensely chocolatey, rich, soft and has a creamy frosting (but it also tastes super yummy without the frosting). 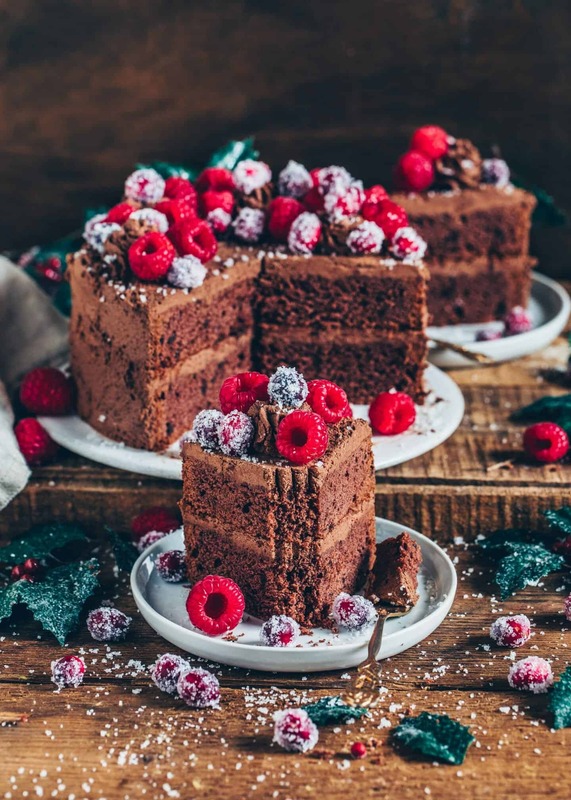 I‘m pretty sure no one will ever suspect it’s vegan and even healthier than other chocolate cakes because it tastes like a classic homemade chocolate cake! 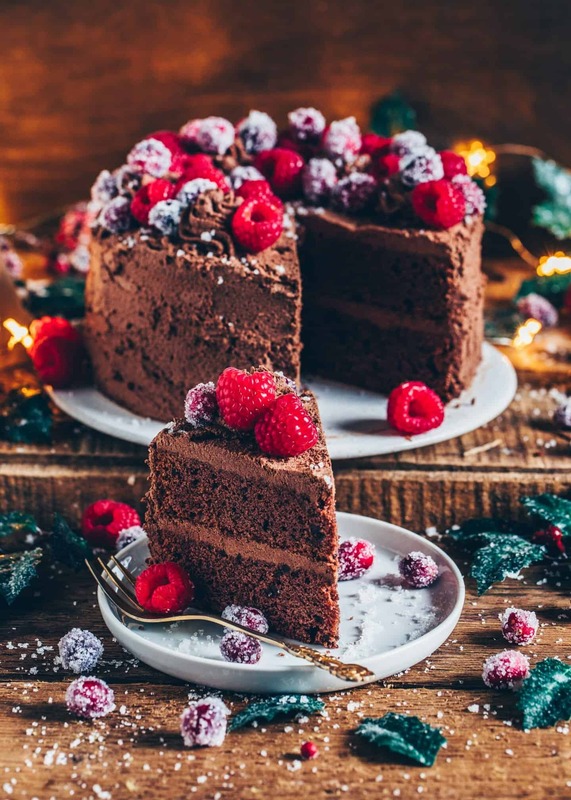 To make this Vegan Chocolate Cake, all you need are just a few simple basic ingredients that you may already have on hand. You do not require eggs or any dairy ingredients, so it’s dairy-free and egg-free. A combination of baking soda, baking powder + apple cider vinegar helps the cake rise, and also keeps it delightfully fluffy. All you need to do is to combine the wet with the dry ingredients. Simply melt chocolate, mix and bake. It couldn’t be simpler. There are several things you can do with this recipe. You can bake this cake in a round tin to make layer cake, like I did, however, this recipe works just as well in a loaf pan or in cupcake and muffin pans. The only thing you should pay attention to is the baking time. For chocolate cupcakes or muffins, it only takes about 15 minutes. A chocolate loaf, however, takes about 50 minutes. I always recommend to do a cake test during baking to check if the cake is done. Baking for too long is not good either because it dries out the cake. 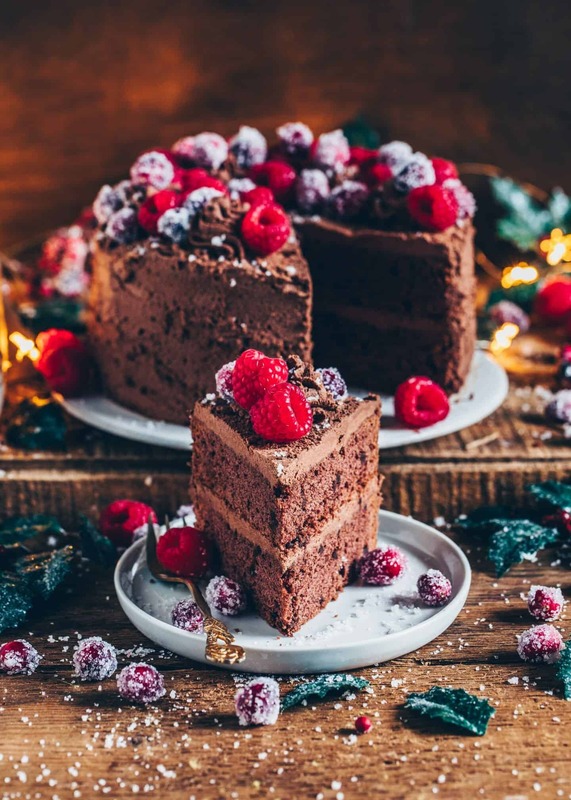 I like this cake best when it’s topped with a fluffy and creamy chocolate frosting, but you can also top it just with vegan chocolate chips, or simply keep it plain. 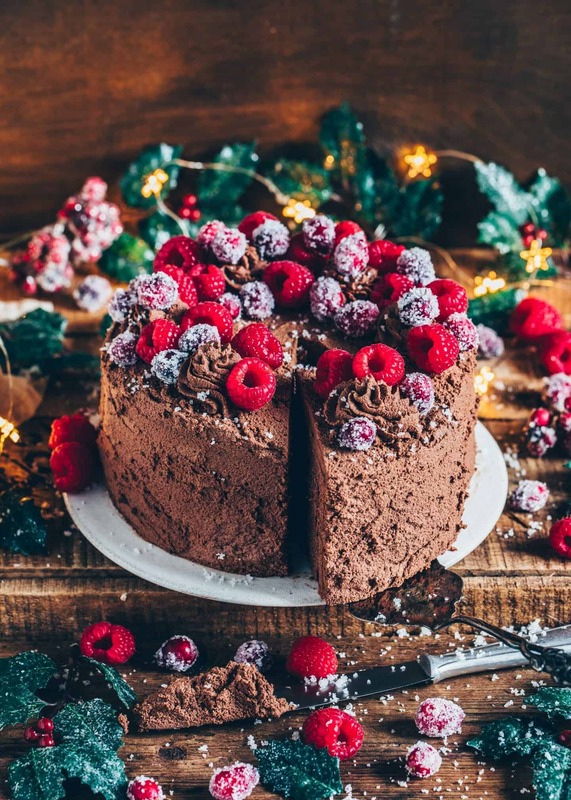 When serving, you can decorate it with healthy berries, sparkling Cranberries or other fruits of choice. 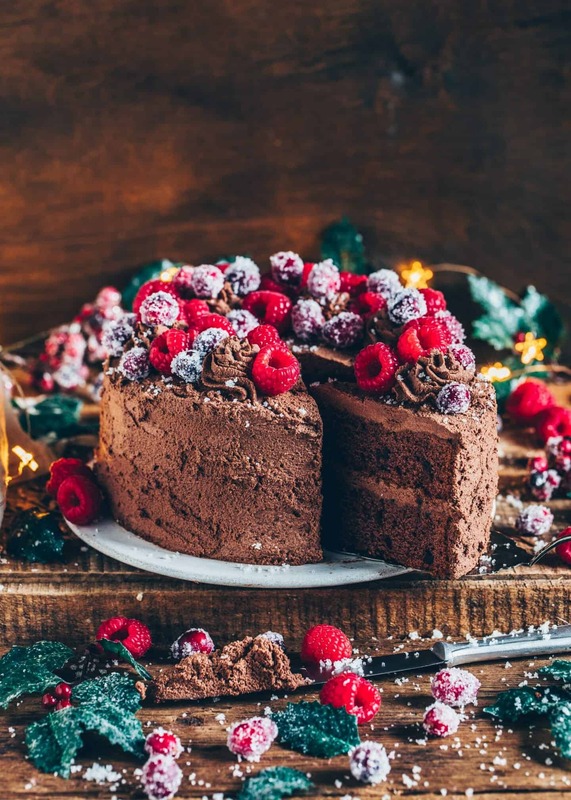 By the way, if you’re making this cake without the frosting, it also tastes great served with a big scoop of vegan ice cream, dairy-free yogurt, or whipped cream on top of your piece. 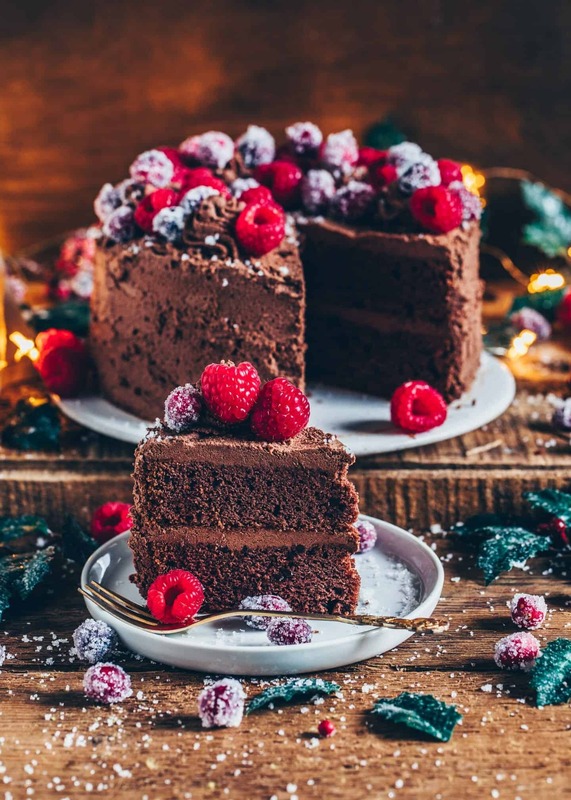 The Best Vegan Chocolate Cake made with simple ingredients in one bowl. It’s incredibly delicious, rich with chocolate flavor and can be made gluten-free. The perfect dessert for any occasions! Preheat the oven to 350°F (175°C) and grease two (or only one) 7 or 8-inch (18/20cm) cake pans. (Optionally, bake the cake in a loaf pan). Stir the apple cider vinegar into the plant-based milk and set aside. Melt the vegan butter or coconut oil and 1/2 cup of the chopped chocolate over a water bath or microwave. Stir in the vanilla extract. Sieve the flour, cocoa powder, sugar, baking soda, baking powder, and salt into a bowl and mix together. Pour the milk and melted chocolate mixture over the flour mixture and stir to combine until no large lumps remain (but please do not overmix). Then, fold in the remaining chopped chocolate. (Taste and add more sugar if desired). Bring the plant-based cream to a boil in a pot. Remove from the heat, add chopped chocolate and stir using a whisk until melted and well combined. Fill the chocolate cream into a measuring jar and chill in the fridge for at least 3 hours. When it’s completely cold, beat with a hand-held mixer on high speed until whipped and stiff peaks form. (Optionally, add 1 packet of cream stabilizer while mixing). Put one cake layer on a serving plate. Spread the frosting in an even layer over the top, then put the second cake on top. Spread remaining frosting all over the top and sides of the cake. (Optionally, save a small portion of the cream for the decoration and fill into a piping bag). 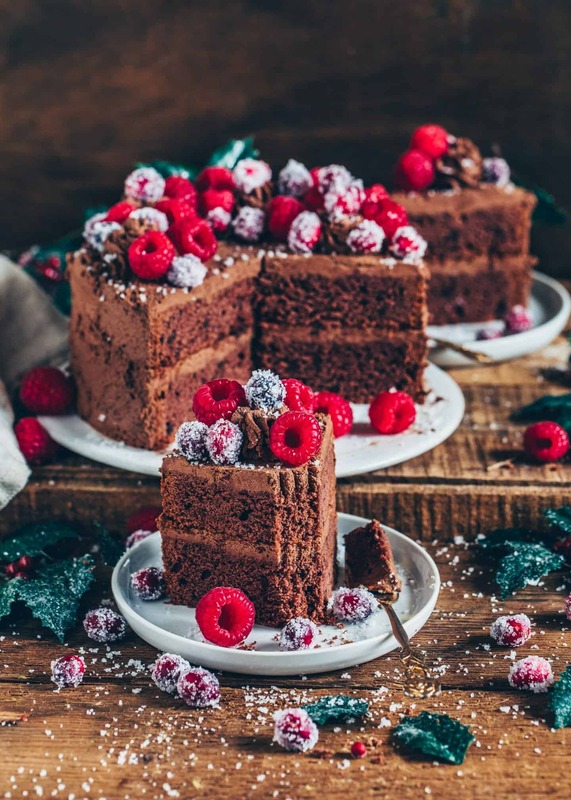 Make pipes on top of the cake and decorate with raspberries, Sparkling Cranberries or other toppings. To make this cake GLUTEN-FREE, you can use a gluten-free flour blend. To make this cake SUGAR-FREE you can use erythritol. I use this plant-based cream for whipping because it gets perfectly stiff. If you want to use COCONUT CREAM instead, refrigerate 2 cans of coconut milk overnight. Then scoop out the solid coconut cream from the cans (you can store the excess liquid in your fridge for another use). You can add any chocolate to taste. You can FREEZE the un-frosted cake for up to 1 month. You can turn the batter into CUPCAKE or MUFFIN pans and bake for 15-20 minutes. 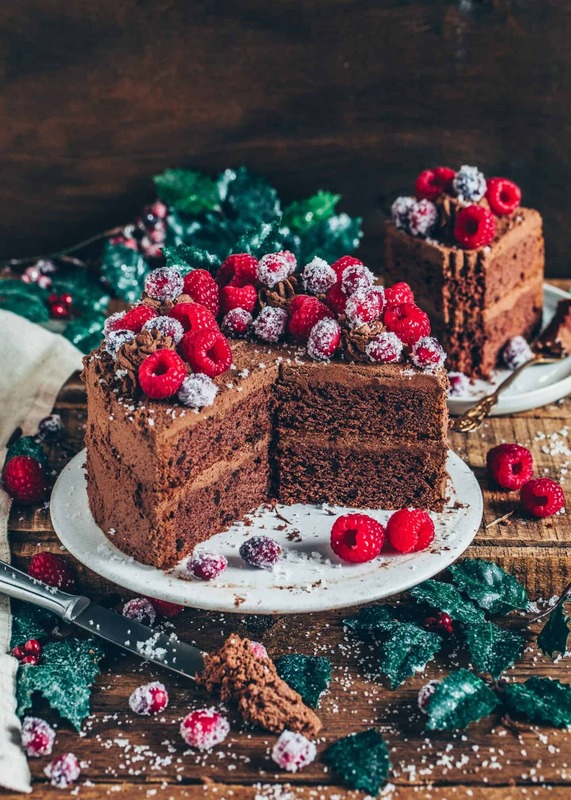 If making this cake without FROSTING, you can top with vegan chocolate chips or enjoy it plain. It tastes also great when served with a scoop of vegan ice cream, plant-based yogurt or whipped cream. Disclosure: This page contains affiliate links that earn me a small commission, at no additional cost to you. I only recommend products I personally use and love, or think my readers will find useful. You can find more information here. I made that cake with my BFF and it was the best cake that we have ever made! Texture of the cake was awesome and quickly we had just a little piece left of that cake when we asked some other friends to come with us! Everyone just loved it! Thank you for the best vegan recepies! 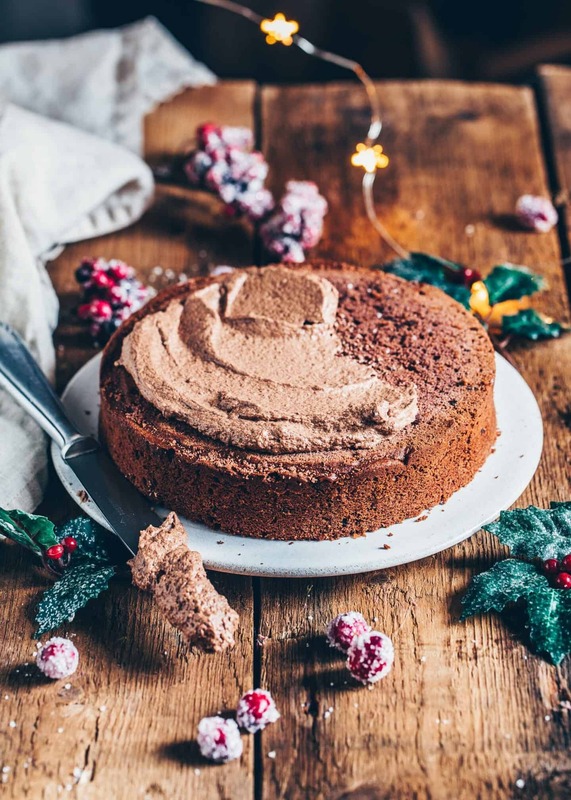 Hi.. Can you please tell whether almond flour can be used in making this cake? I don’t recommend using almond flour because it will make the cake dry. But feel free to try it. I would not let it cool completely in the tin. I recommend to grease the tin and then also line with parchment paper for an easier removal. Let cool for 10-20 minutes before removing onto a cooling rack.